PT Asuransi Jiwa Bringin Jiwa Sejahtera - BRI Life is a rapid growing financial services company in Indonesia with core business focus on life insurance industry. 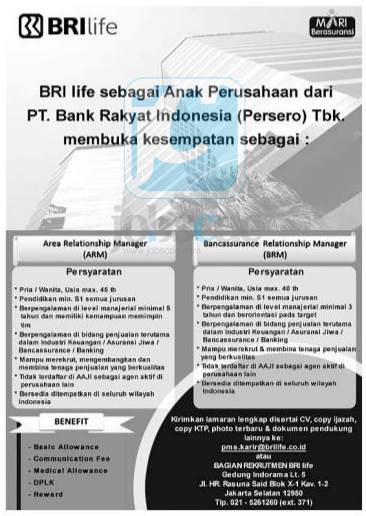 BRI Life was formed by Pension Fund of PT Bank Rakyat Indonesia (Persero) Tbk (DP BRI) in 1987. BRI Life is a directly-owned subsidiary company of state-owned lender PT Bank Rakyat Indonesia (Persero) Tbk (Bank BRI Group). At present, BRI Life is 90.17% owned by Bank BRI Group and 9.56% by the Employee Welfare Foundation BRI (YKP BRI), and 0.27% remaining shares by the Employees Cooperative of PT AJ Bringin Jiwa Sejahtera. Headquartered in Jakarta, BRI Life runs its business through 41 conventional marketing offices and 11 sharia marketing offices spread in all over Indonesia. In term of financial performance, BRI Life succeeded in achieving acceptable and sound growth. 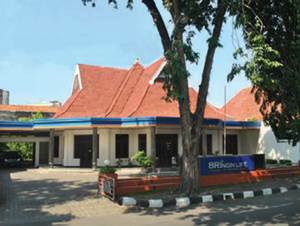 According to PT Asuransi Jiwa Bringin Jiwa Sejahtera Annual Report 2014 as cited by JobsCDC.com, BRI Life recorded 75.54% increase in net income in 2014 to Rp 410.36 billion, compared to Rp 233.76 billion in 2013. Total revenue that has been recorded by BRI Life in 2014 amounted to Rp 2,247.35 billion or about 21.76% from the previous year which was amounted to Rp 1,845.66 billion. Male/Female, maximum age of 45 years old. Minimum 5 years of experience in managerial level and able to lead a team. Previous experience in the field of sales, especially in financial industry, life insurance, bancassurane, banking. Able to recruit, develop and foster a team of qualified sales force. Not listed in AAJI as an active agent for other companies. Male/Female, maximum age of 40 years old. Minimum 3 years of experience in managerial level and able to lead a team. JobsCDC.com now available on android device. Download now on Google Play here. Please be aware of recruitment fraud. The entire stage of this selection process is free of charge. PT Asuransi Jiwa Bringin Jiwa Sejahtera - Recruitment Pro Hire Program BRI Group November 2016 will never ask for fees or upfront payments for any purposes during the recruitment process such as transportation and accommodation.